What did I decide to cook on one of the few glorious sunny weekends we have had in the UK this year? I had planned an (almost) Italian themed meal, using our beloved Beehive Terracotta oven, which usually snuggled under our garden tent, as if protecting itself from the monstrous rivulets of monsoon rain that seem to have hit this area of East Yorkshire over the last few summer (hah!) months. But then I thought, “Well, why not. For once let’s enjoy cooking in the Wood-Fired oven without having to dodge the rain.” And Erik agreed. So, the Wood-Fired Oven cooks Italian (Well, almost). The thing was … I had been looking at old photos of our Italian holidays, spent in an ancient old farmhouse only 10 minutes outside of my favourite city of Lucca, in Tuscany. We rented it with friends year after year, but sadly haven’t been able to visit it for a while. Tuscan Farmhouse – Our dream holiday home with friend, Sandra, peeping back at me. 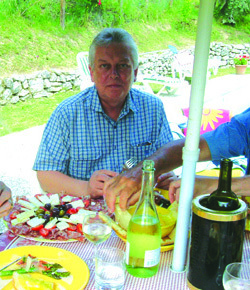 Erik in Tuscany, eating lunch around the pool. Oh, how I want a glass of that chilled white wine now. Suddenly I had a yearning, a real hankering, for all the colourful Italian vegetables that we used to buy at the markets and the Esselunga supermarket in our village, which helped us to create feasts for all our friends. Huge, ripe globes of streaky red/yellow/green tomatoes, forests of fresh asparagus bundled together in rubber bands, aubergines so shiny purple that you could see your face in them, and so much more. Then a dish implanted itself in my brain, up my nostrils, and visually, in my eyes. I could smell it, taste it, almost touch it. It was a yearning for Aubergines, Italian style, sliced and covered with a Tomato and Basil sauce, layered with gooey, melted Buffalo Mozzarella, and topped with roughly grated, slightly salty Pecorino Cheese. (I know it should be Parmigiana, but I had a big piece of Pecorino left in the fridge, and, in these days of economic tribulations, decided to be good and use it up). This great Italian dish is wonderfully named ‘Melanzane alla Parmigiana’. The next question was, whose recipe should I follow? 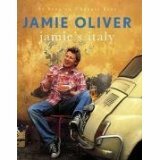 Gennaro Contaldo wrote up his recipe in the March 2012 edition of the magazine “Delicious”. 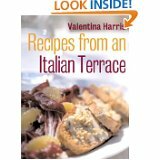 Another favourite of mine, Italian author and chef, Valentina Harris, wrote up a recipe in one of my favourite Italian cookery books, “Recipes from an Italian Terrace”,(click here to see it on Amazon) and Jamie Oliver’s book, “Jamie’s Italy”, (click here to see it on Amazon) one of the best modern Italian cookbooks around at the moment, also had a version of this famous dish. Well, according to Gennaro Contaldo, you slice the Aubergines, dust each slice in plain flour, then coat with beaten egg. After that, fry in hot oil until golden. Valentina Harris brushes the Aubergine slices lightly with olive oil and grills them until soft and gently browned, and Jamie also likes to oil and then grill or griddle the slices until crisply golden. It used to be that the slices had to be salted and left in a colander to drain, but a lot of chefs seem to miss out that bit nowadays. But in the end, my recipe used a mixture of all their ideas. Click here for my recipe of “Melanzane all Parmigiana”. My Melanzane alla Parmigiana in Wood-Fired oven. Personally I would be happy to eat a big bowl of “Melanzane alla Parmigiana” just with some crusty bread, to dip in the juices. But Erik preferred to have it as a side dish. So what could we team with this gutsy Italian dish? For inspiration we trotted off to our local butcher, Gary Alden, and were once again seduced by a great Leg of Lamb. But this time, no slow-cooked Lamb for us. Definitely not. I wanted to cook it Italian style, butterflied and studded with our own, freshly dug up Garlic (some had escaped the dreaded Garlic Rust), Anchovies and Rosemary. Erik boned the leg, and opened out the Lamb. I heated up some oil, and quickly browned the bone, and added thickly sliced onions to act as a bed for the butterflied Lamb. Meanwhile, I had lit the Wood-Fired oven early, about 2.45 pm, gradually built up the fire with our seasoned wood, then once the oven was warmed up we stoked the fire until it reached a very hot 650°F, pushed the embers towards the back until the flame hit the back wall and curled up to the middle of the pointed roof. Then we let it ‘tick over’ until we were sure it had cooled down to approx. 375/400°F (190/200°C). We then added a log every so often, to keep it at that temperature. I’ve entitled this article ‘Wood-Fired Oven cooks Italian (Well, almost). The ‘Well, almost’, is because the final part of the meal we decided on was Lyonnaise Potatoes. A French-style recipe of Roast Potatoes, guaranteed to make your mouths water. The potatoes, (Maris Piper in this dish), are pre-boiled for about 6 minutes, drained and dried for a minute on the hob, shaken well in the pan then placed in the already heated oil in the roasting dish, placed on top of thickly-sliced onions, plus sliced garlic, and presumably called ‘Lyonnaise’ after Lyon, centre of the French food culture. Not Italian, mea culpa, but near enough to Italy (at least they join up at the border). The Lamb had been gashed and studded on both sides with folded anchovies, slices of our garlic and sprigs of our rosemary, laid on top of the roasted bone and onions, then I lightly oiled the fatty top and rubbed in another of my favourite spices, Sumac. Once the Wood-Fired oven had reached the cooler 375°F (190°C), I placed the Lamb, in it’s fire-proof dish, on the floor at the front of the oven, and kept turning it around and checking to make sure the fire wasn’t too fierce. It is really so important to get to know your Wood-Fired oven, and don’t think it is only any good when there are lots of flames. For this Lamb, I just needed it to roast in a similar way to an AGA, or electric or gas oven. Not too fierce, the embers mostly grey, but it needed about 30 minutes (and we like it pink in the middle), then we gave it another 35 minutes to rest, whilst we cooked the potatoes and the aubergine dish. This was the juicy and so tasty Italian Lamb, after being cooked in our Wood-Fired Oven. It tasted sensational. Our plateful of Italian Lamb, Melanzane all Parmigiana and Lyonnaise Potatoes. not exactly Michelin star presentation, more homestyle, but it tasted fabulous. So that was the story of the Wood-Fired Oven Cooks Italian (Well, almost). In actual fact, we had a very sunny day, but just at the point where I wanted to take the Lyonnaise Potatoes out of the Wood-Fired Oven, and dash across to the house with the hot dish, the heavens opened again. Monsoon style once more. But thankfully it only lasted 2 or 3 minutes, then the sunshine returned. Thank heavens. Writing this has bought back so many memories of the farmhouse in Italy, and the fact that we all used the old ‘Forno’, basically an ancient shed, about 5 foot wide and 8 foot deep, with a waist-high floor of rock or paving stones. We swept out all the dust and spiders and cobwebs, swabbed it down and made the fire. Once lit, late afternoon or early evening, it was still warm the next lunchtime. Heavens, they knew how to build ovens in those days. But we felt humbled and proud that we made it work, just as the farmer’s wife had done hundreds of years ago. I’m not quite sure whether we have taken a step back in time with our Wood-Fired stove, or whether they knew a good thing or two back in those dark days. All I know is that the food tastes sensational. So that is good enough for me. Thanks so much Megan. Will look into that. Regards Astri.